Irish stew is a traditional Irish stew made from lamb, beef or mutton, (mutton is used as it comes from less tender sheep over a year old and is fattier and more flavourful) as well as potatoes, carrots, onions, and parsley. Left: In a modern lamb stew, the meat is browned first to give colour. 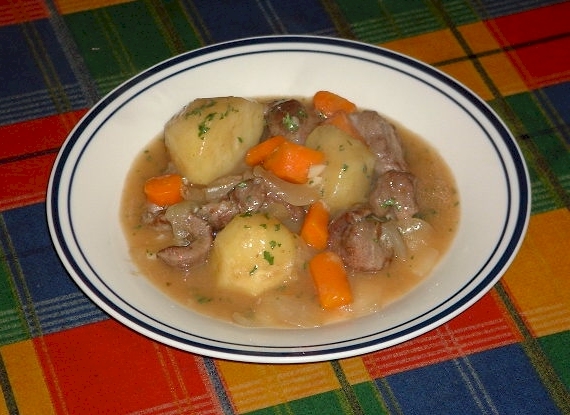 The essence of Irish stew is summed up in the recipe's entry in The Joy of Cooking: "This famous stew is not browned." More recently, stouts have been added to provide extra flavor. 1 lb of stewing beef. 2 stock cubes, or 1 pint of homemade/prepared stock. Boil the stewing beef alone for about 1 hour. Strain off most of the fat. Chop the vegetables to spoon size. Put all ingredients in a big pot including the stock, and bring to boil and simmer for 1 1/2 hours.